It’s Thanksgiving morning and Justin and I are getting ready to cook up a small storm. Not hurricane-sized, but more like a small rain shower. 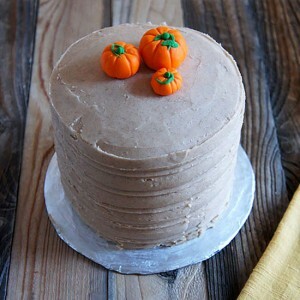 Justin had a day off this week while I had to work, but I came home to this Pumpkin Spice Cake and was beyond thrilled! We’re serving it today as Thanksgiving dessert, but we did devour a small slice early, just to check for quality of course. This cake is hands-down, the best cake I’ve ever had in my entire life. The sponge is so smooth and moist with a dense texture, but the taste was unbelievably light and creamy. All of the seasonings come together making this cake taste like the most perfect Thanksgiving dessert. 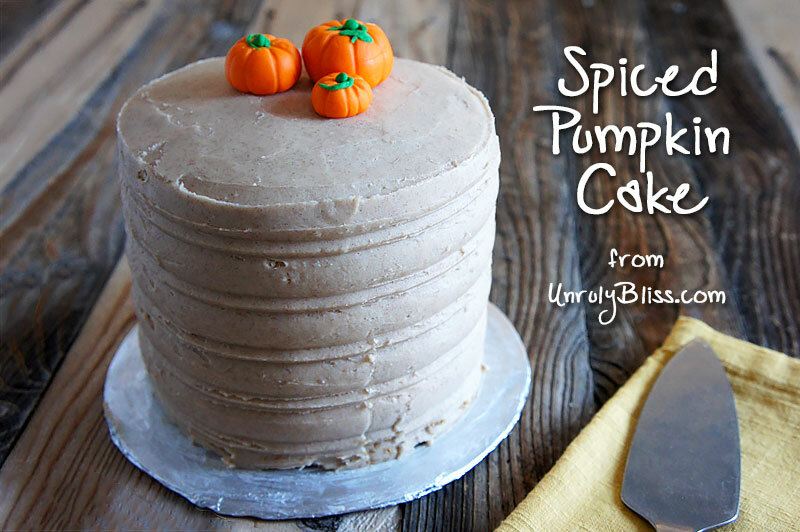 You’re getting your classic pumpkin flavor with ginger, cinnamon, nutmeg, and cloves. It’s so wonderfully delicious and more than worth the time and effort it takes to create something so beautiful! For more beautiful cakes like this one, check out Peggy Porschen’s delightfully charming cookbook titled “Lovely Layer Cakes.” The recipe posted below is directly from her book. I bought it as a random gift for Justin because I knew he wanted to step up his cake-game without going too far beyond his skills. This book is definitely meant for those who are relative beginners, but want to create such gems like Salted Caramel Cake, Red Velvet, Strawberry and Champagne Cake, and S’mores Cake. You won’t be disappointed! Preheat your oven to 344*F (170*C). Line three 6-inch round sandwich/cake pans with oil spray and wax paper. Melt the butter and let it cool slightly. Put the pumpkin puree, salt, buttermilk, and sugar in the large bowl of an electric mixer and, using the whisk attachment, mix well. Add the eggs gradually, whisking well between each addition. Sift together the flour, baking powder, baking soda, and spices. Lightly whisk the flour mix into the pumpkin mixture in two batches. Add the melted butter and gently incorporate until just mixed. Carefully pour the batter into the prepared cake pans and bake for 20 to 25 minutes or until the sponges spring back when gently prodded and an inserted skewer comes out clean. Remove the cakes from the oven and let rest for about 10 minutes. Once just warm, run a knife all the way around the insides of the pans, remove the sponges, and let them cool completely on wire racks. Wrap the sponges in plastic wrap and let them rest overnight at room temperature. This will ensure that all the moisture is sealed and the sponges firm up to the perfect texture for trimming and layering. Place the cream cheese in a bowl and beat until smooth and creamy using an electric mixer. Place the butter and a third of the sugar in a separate bowl and cream until very pale and fluffy. Add another third of the sugar and repeat. Add the remaining sugar and beat again, scraping the sides of the bowl to ensure no lumps remain. Add the cream cheese, a little at a time, and mix at low speed until combined. Trim the three sponge layers and sandwich them together using the cinnamon frosting. 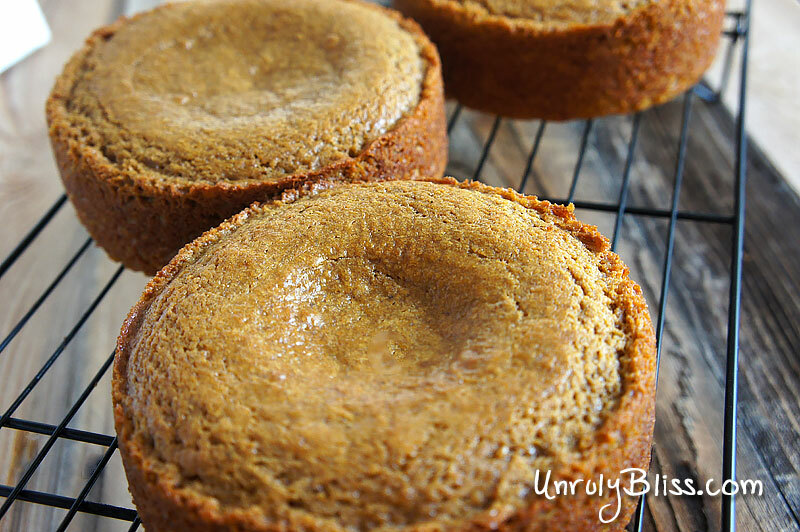 To do this, use a bread knife or cake leveler, trim the top crust off each sponge. For the middle layer, also trim off the browned base of the sponge. Aim to make all the sponges the same depth, using a ruler if necessary. After trimming, brush the crumbs off the sponge cakes. Spread your cake board with a thin layer of frosting and lay down your first layer of sponge (this helps to keep it from moving). Use a palette knife to spread the filling over the top of this first sponge layer. Spread out the filling evenly, making sure it goes all the way to the edges. Don’t put too much filling to where it will ooze out when you lay down the next sponge cake. 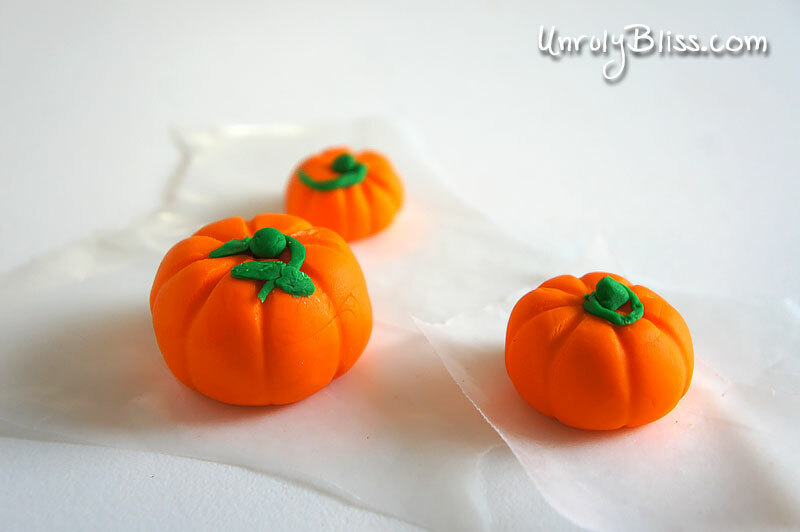 Place the next sponge layer on top, cover it with frosting again, and then place the third sponge layer. Make sure your top layer is level and gently press out any air bubbles in the frosting between the layers. Mask the top and sides of the cake with the remaining cinnamon frosting. To do this, begin by applying a crumb coat. This will hold the sponge surface in place and provide a good basic shape with which to work. Using a palette knife, pile a generous amount of frosting onto the top layer of the cake. Working from the center, spread the mixture toward the edges of the cake and down the sides. Be sure that the cake is completely covered with no gaps anywhere. This is not your final layer of frosting, so don’t worry if it’s not pretty just yet. Use your palette knife to constantly smooth and shape your cake, especially at the edges, until you’re happy with the shape. Use an indented or patterned scraper if you’re wanting the look of indented lines around the cake (as shown in our pictures). Let the cake chill in the refrigerator for at least half an hour, the repeat the crumb coat, if necessary, allowing 30 minutes of chill time with each coating. Apply the final coat, use a fresh, crumb-free batch of frosting. When you’re satisfied with your final coat, return the cake to the refrigerator for one hour, or until the frosting has set. 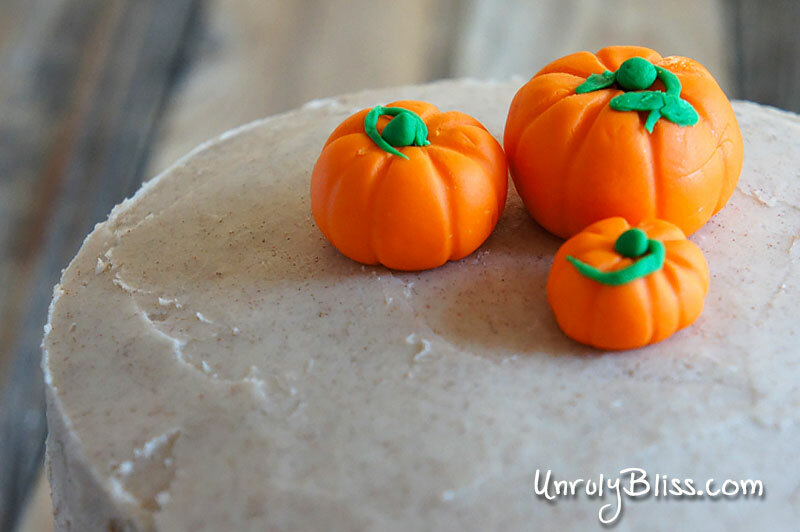 Decorate the cake with marzipan pumpkins (which can be purchased), or purchase small batches of colored fondant and create your own small pumpkins (as Justin did with our cake). I’ve almost finished my master’s degree! Just two weeks left in the semester and then graduation. Words cannot express how happy I am to be thisclose to finishing! It means more time for my husband and daughter, more time for friends, and more time for cooking and blogging!